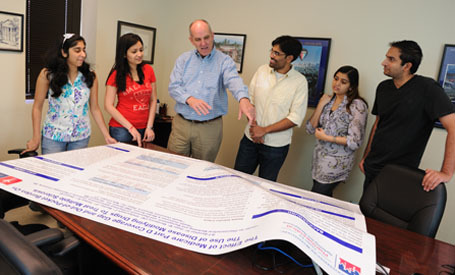 The Department of Pharmacy Administration offers unique educational opportunities to the students enrolled at The University of Mississippi. The Department offers a M.S. and a Ph.D. in Pharmaceutical Sciences, with an emphasis in Pharmacy Administration. For 50 years, the Department has provided quality graduate education. The Department has provided the highest quality graduate education for more than 45 years. While the Department is most notably recognized for its pharmaceutical marketing and management programs, it provides graduate training opportunities in pharmacoeconomics, pharmacoepidemiology, pharmaceutical policy and outcomes, and social behavioral issues related to pharmacy. Faculty and students are interested in the marketing and outcomes of pharmaceuticals and the role of pharmacists in the delivery and management of health care. For a presentation about graduate education in pharmacy administration and our program, follow this link. The Three Minute Thesis (3MT®) is a research communication competition that is being promoted by graduate schools throughout the US and the world. This activity challenges graduate students to present a compelling oration on their research thesis/dissertation topic and its significance in just three minutes and allows them to use one Power Point slide. 3MT develops academic, presentation, and research communication skills and supports the development of research students’ capacity to effectively explain their research in language appropriate to a non-specialist audience. This skill is critical for all graduate students across all of the academic disciplines. Two Pharmacy Administration graduate students received top honors in the most recent competition. View Sujith’s three minute thesis. Amod Athavale – First Place, Ph.D.
View Amod’s three minute thesis.